Christmas my 4th grade year, my parents got me the entire Little House on the Prarie book collection. Right after opening the first book, Little House in the Big Woods, I had my first ever binge-reading experience. By the time I worked my way through the series (which I read before the new year) I also had my first ever “book crush”. I was completely captivated by the character of Almanzo Wilder and his very apparent love and affection for Laura Ingalls. Granted, I was’t quite 10; however, I felt the pull even if I couldn’t identify it properly. I re-read that series dozens of times over the years. As I entered adulthood, I’d find myself reading These Happy Golden Years regularly — any time I wanted to just read something quick I knew would make me happy. That book is the book where their romance blooms, Almanzo actively courts Laura, and by the end of the book they are married. Almanzo was intelligent, morally courageous, and strong. He wasn’t afraid to do what needed to be done. , In true romance-novel-hero-style, he was actually a hero, traveling 40 miles round-trip in arctic temperatures to bring wheat to his starving town. When he realized how bad the living conditions were for Laura when she was teaching 12 miles from home, he would make the 24-mile round trip twice every weekend to bring her home — once even during a blizzard. He built her a house that just oozed with the love he had for her. “‘Like your pantry?’ he asked her, and she thought how many hours he must have worked, to put all those shelves and to make and fit those many drawers.” Hours, I’ll add, that he worked on top of his farming work. He completely respected Laura as an individual. He let her help break horses even though she was very petite and not as physically strong as she wished she could be. And, he never even flinched when she asked him to strike the word obey from their wedding vows. When she was pregnant and so very sick, he insisted she stay in bed then did the best thing ever — brought her a feed bag full of books so that she could lose herself in the stories and forget how sick being pregnant made her. I’ll add he was also really good looking. The Farmer Boy is one of my favorite novels of all time, and made me wish I lived on a self-sustaining farm. I always think about it when I’m canning apples or making homemade ice cream. I love that my own husband loves food and my cooking as much as young Almanzo loved food and his mother’s cooking. The story of Almanzo and Laura Wilder was what I label “sigh worthy” and I have never grown tired of it in the 36 years I’ve been reading it. I blossomed in my heart to love romances, and eventually write them. I love that it’s a true (fictionalized) story and that they were real people who loved Jesus and each other. Do you have a favorite romance hero crush? Comment for a chance to win an autographed copy of my recent release, Courting Calla. This giveaway is open to everyone, no matter where you live. All commenters will also be entered to win one of two monthly $20 Amazon gift cards that we give away on inspyromance.com. Please reply by November 23, 2018, at 5pm EST. Ian knows God has chosen Calla as the woman for him, but Calla is hiding something big. Can Calla trust Ian with her secret, or will she let it destroy any possible hope for a future they may have? Heathcliff from WUTHERING HEIGHTS is a great favourite of mine. He loved so fiercely. He often comes up in lists! That one looks so good! I’m going to have to read it. 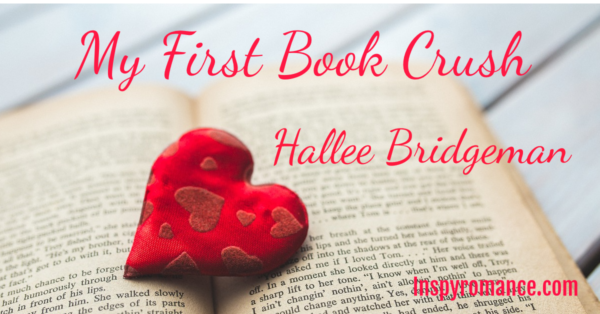 Hi Hallee, I enjoyed Calla and Ian’s story- made me want to volunteer in Haiti. Our school runs a mission trip each year to a south east asian country; the people who run the orphanage have just 20 cents per child per meal to spend on food, yet the children are so full of joy. Hmmm, favourite romance hero/crush? I distinctly remember reading Brock and Bodie Thoene’s Zion series as a teenager and thinking that Moshe was everything wonderful! I still re-read the books and love Moshe. I have to confess that I also love James from A Melody for James. He is dreamy!! That orphanage is real, just the people in the book are fictional. I have a group of friends leaving in about 10 days to go work there for a week. I’m so wishing I could go with them! Hmm. No favorite romantic hero crush since I tend to love them all while I’m in their world. Hi Hallee! You brought back so many memories with this post – thank you! I loved Almanzo too (never really got his name, though! ), but I think one of my major crushes as a teen was Gilbert Blythe (sigh!!) before I encountered the ultimate: Fitzwilliam Darcy. I always wondered about that too, thank you for the definition! Good morning! I always enjoyed LHOTP too, your post makes me want to go back and read some again! I enjoy the hero’s in most every book I am reading…or I wouldn’t be reading it, lol. A few stand out for me, or should I say stay will me, like Noel in Wild Mint Tea….and Tony Viscolli from the Jewel Series, live that fictional man!! Derrick is great too, but Tony has my heart, lol. I love how you made him an important part of each book, even bringing him forward in the kids stories! I very much agree with your assessment of Almanzo! My first book crush would have been Wynn in the When Call the Heart Series by Janette Ok. I was 11 when my mom gave me the first book and I was hooked. So much so that I really struggled when Hallmark came out with the TV series… It just wasn’t right 😏. I have come around, as my teen daughters love it, but I still love Wynn. Also, you have an incredible way of making your characters come alive! I have reread your Jewel and “music” series countless times. I love getting lost in them! Wynn was a great character! Thank you so much! I’m so happy that you enjoy them enough to re-read them. Oh, Hallie! A girl after my own heart! Almanzo was definitely my first book boyfriend, along with Cap Garland! I’ve re-read Little Town on the Prairie, Long Winter, and These Happy Golden Years more than any, and they never get old! Cap was a great character. I wish there was a book about him! Fond memories of The Little House series. We didn’t have our daughter at the time so we gifted our set to our babysitter. It’s just not the same for boys, I think. We read FARMER BOY out loud on a trip one time with my boys, but they weren’t interested in the other books in the series. My daughter enjoyed them, but not on my scale. Hi Hallie! While I never read the Little House on the Prairie series, I did watch the TV show. Interesting comments about Almanzo. Not sure I can identify my first book boyfriend, except maybe Christy’s beaus in Catherine Marshall’s book. Best wishes. The TV series did little to capture the Almanzo of the books! I didn’t discover Little House until my daughter was about seven. It’s the series I was reading to her when she took off reading on her own. For a couple of books I’d read to her in the evenings, and she’d read when she wanted to, so I got only parts of the stories! Had to catch up. I loved Farmer Boy because of my farming background. Loved knowing how they cut ice in the winter and stacked it and insulated it for use into summer. Tidbits like that I found fascinating. I don’t think I ever had a “book boyfriend” as a child/teen, even though I read a lot. Still don’t. Like MJSH said, I tend to love them (most of them LOL) while reading their story, then on to the next one. Yikes. Serial monogamy lol. Some of my own books’ heroes are definitely in that category for me, though. Paula mentioned Noel from Wild Mint Tea. Oh, YES! Rob Santoro from Other Than a Halo is another for me. There are a couple of more. I love my heroes, too. 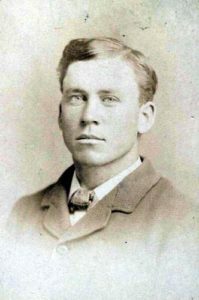 I was absolutely enamored by Almanzo, and the tv series only magnified the crush. I love the Little House books so much. Makes me want to go read this series today!! I somehow missed out on that one as a kid. I read the entire Christy Miller Series, and Sierra Jensen series by Robin Jones Gunn (two YA series related to each other) and those were the first true christian fiction books I fell in love with. I really liked Sierra Jensen’s love interest, Paul. There are soo many awesome heroes throughout literature it’s hard for me to remember which ones really stuck with me for years. As an adult, I have found that the heroes that draw me in the most, are those heroes who are broken and need to find healing. Which is what I tend to write as well hehe! “Tortured heroes” are my favorite to write! My daughter read the Christy Miller and Sierra Jensen series. My favorite hero and romantic is Cole Sage from the series by that name written by MICHAEL MAXWELL. Cole is a newspaper reporter. He appeals to me because he fights for justice and the underdog. He is one of the good guys and he loves one woman. I also crush on Mr. Darcy in Pride & Prejudice and Gilbert Blythe from Anne of Green Gables. I never did like the TV Almanzo. I’m not sure why. Hey Hallee, I had the entire collection too. But I watched the show before I read the books, so I was in love with Pa. Even though I was only 9 at the time. I really don’t have one. 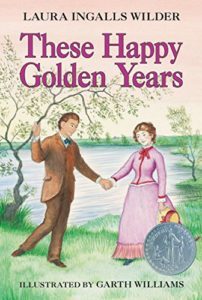 I love These Happy Golden Years, too and have read it a few times. It’s been a while since I read it though and I decided to start re-reading the series a couple of months ago. One of my favorite heroes is Landon Blake from Karen Kingsbury’s Baxter family books. The Baxter Family are always good ones!